Ryan Croasdale isn’t unduly worried by AFC Fylde’s back-to-back defeats, attributing their latest loss at Dagenham and Redbridge to a proud new dad. Ryan Croasdale isn’t unduly concerned about AFC Fylde’s back-to-back defeats, attributing their latest loss at Dagenham and Redbridge to a proud new dad. The midfielder had little cause for complaint after his team’s performance in the 2-1 defeat by the Daggers last Saturday, but believes the hosts’ especially inspired goalkeeper was a major factor. Dagenham keeper Elliot Justham took to the field just two hours after his wife gave birth to a daughter. Andy Bond gave Fylde a first-minute lead but any ideas that Justham was distracted at the Chigwell Construction Stadium were soon dispelled as he proceeded to thwart the Coasters for the rest of the afternoon. Justham also saw his team hit back with goals by Conor Wilkinson and Jack Munns as they continued to climb away from the foot of the table. And Croasdale said of Fylde’s first away defeat of the season in the National League: “I think it comes down to the fact their keeper had a very good day, especially as he and his wife had a child in the morning”. It has been a satisfying season so far for Croasdale, who has featured in all 20 league games and captained England C to victory over Estonia Under-23 at Leyton Orient last month. He said: “The lads were really disappointed not to get anything from Saturday’s game. 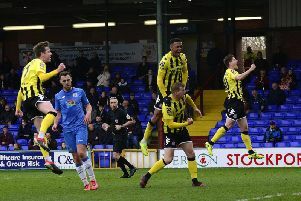 Croasdale, whose side face Boreham Wood at Mill Farm on Saturday, is impressed by the squad he has joined since his summer move from Kidderminster Harriers on a three-year deal. He added: “It’s a very hardworking team . We look at the stats and everyone is covering 10-12km per game.